It's Monday! I wanted to share this card I made using AJVD's "Seas the Day" stamp set from Whimsie Doodles. How absolutely adorable this set is! And so fun too! Coloring the mermaid was so relaxing and truly did "bubble my troubles away". Stamp mermaid from "Seas the Day" with Memento Tuxedo Black dye ink. Color the image with Copic markers. Using Copic markers, draw the ocean floor, and flick upwards to create the water. Adhere three crystal beads to the card to serve as bubbles. Using Versafine Onyx Black, stamp sentiment which is also from "Seas the Day". Have a pleasant week! I'll be back again next Monday with another AJVD project! What a positively beautiful card! 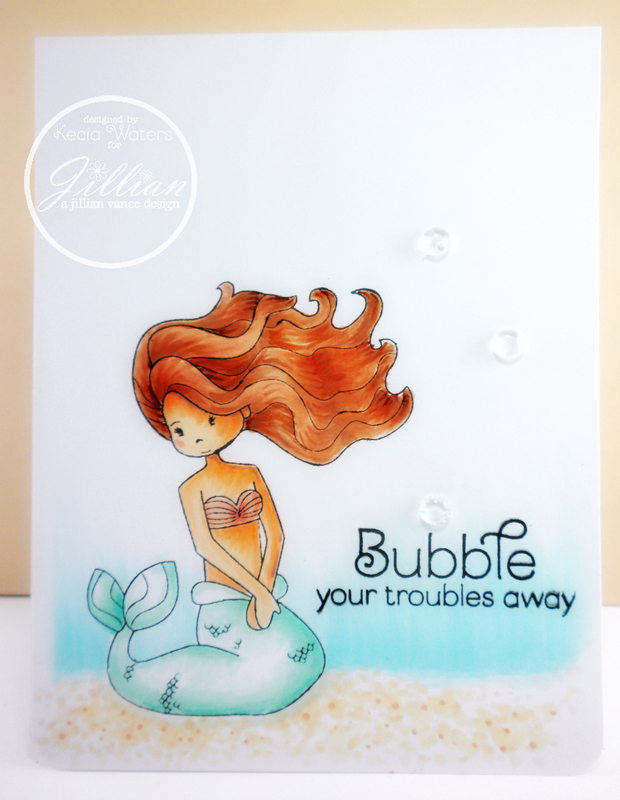 Love the Copic coloring and the little beads as bubbles...so very clever!